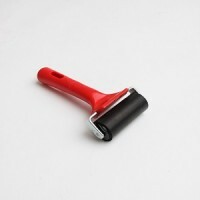 Ensure your tapes are firmly applied using an EPDM rubber 55mm Lino roller. Manufactured from a robust and durable polypropylene; has self-lubricating nylon bearings, aluminium core and continuous steel shaft. This versatile rollers can be used for a wide range of applications. The handle includes a back rest to hold the roller away from the working surface when turned upside down.